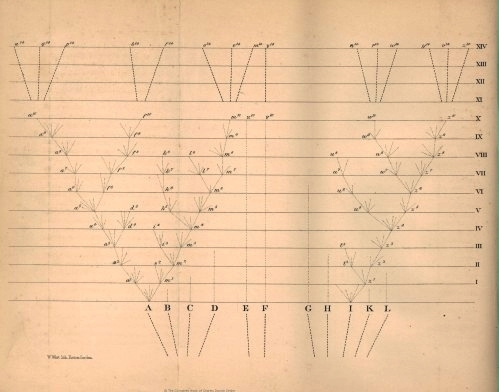 The Origin of species only had a single illustration, this lithographic diagram by William West demonstrating how the degree of similarities between a number of varieties and species is explained by descent from common ancestors. Compare with the diagrams in Natural selection (and the original manuscript DAR10.2.66). See also Darwin's conjectural diagrams of the development of mammals.